The Spring Mill area was very popular as a walk and leisure area, although at the time of the picture above in the 1940s, it was quite unofficial. Spring Mill is now a designated leisure area owned by Wakefield Metropolitan Council, and is close to the golf course off Queen's Drive. Where the current small lake is situated was the old mill dam, fed by a spring which flows down from Palesides and Lodge Hill. During the summer months, the dam at Spring Mill became an open-air lido. A health and safety nightmare today, the edges of the lake were liberally layered with guano from the dam's resident duck and geese population. Nobody questioned the quality of the water that was pumped in and out of the mill. There was a rich and varied selection of wildlife in the area with kingfishers, finches, pigeons and cuckoos regularly seen around Spring Mill. 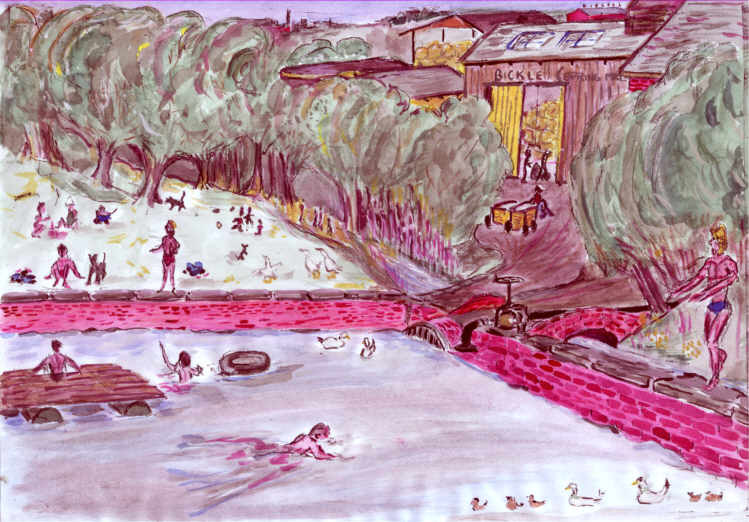 The Mill was owned by the Bickle family and they had a very relaxed attitude with no-one interfering much with what went on at the unofficial lido.